Late in the afternoon on D-Day, the 746th Tank Battalion, carrying infantry from the 325th Glider Infantry Regiment, lead by elements of the 4th Cavalry, moved from the Utah beachhead to like up with the paratroopers holding Chef-du-Pont before dark. 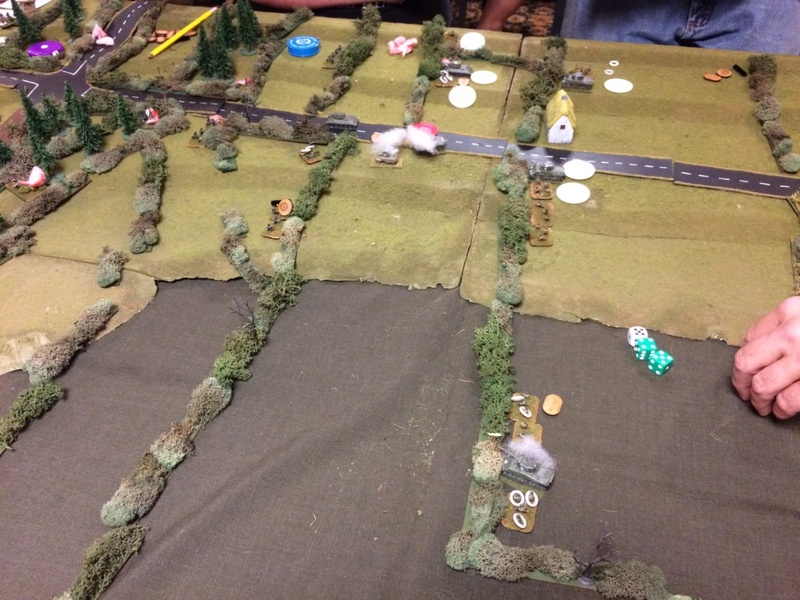 A reinforced company from the 1057th Grenadiers moved into blocking positions at the end of a valley just in time. The scenario is from the Two Fat Lardies’ D-Day scenario book. I have run it several times with various over the last 10 years and it always gives a fun, nail-biting game. For Historicon, I cut the forces in half. The US had 8 Shermans, (I forgot 2 of them, but used a couple T-34s as stand ins), 2 glider platoons (each minus a squad) and a pair of M8s. 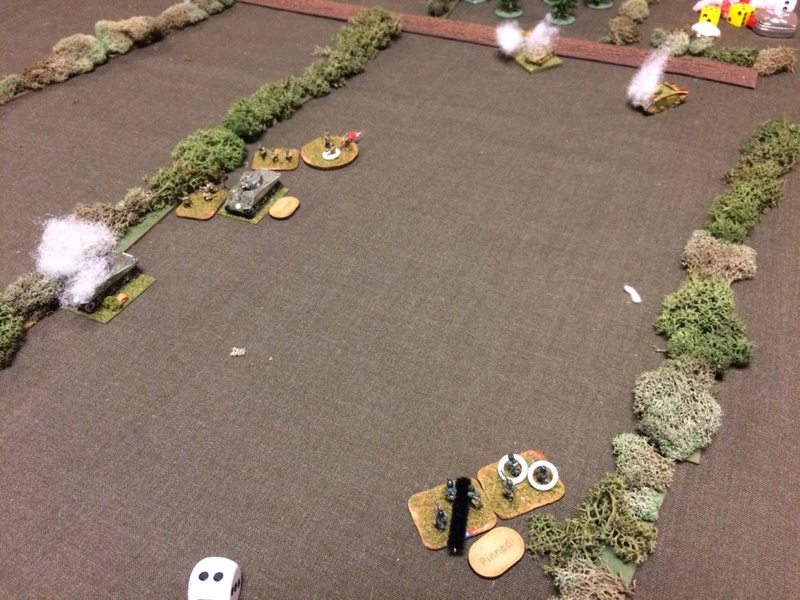 The Germans had 2 platoons of infantry (each minus a squad), a pair of MMGs, a panzerscheck, a PaK 40 and a PaK 43. They also had a 1st priority 105 mm artillery mission. 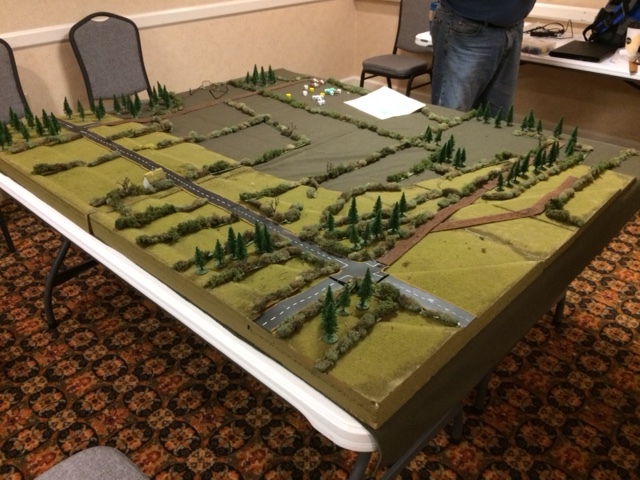 Turn 4 saw a counter attack by a nearby panzer training center come in behind the surprised American left flank. The panzers were obsolete tanks captured in 1940. The US had BR 41 and the Germans 40. Of the 6 players, 1 had played a game previously and 1 had read the rules. As usual, I forgot to get photos, so a big Thank You goes out to player Howard Montgomery who took these and was gracious enough to share. 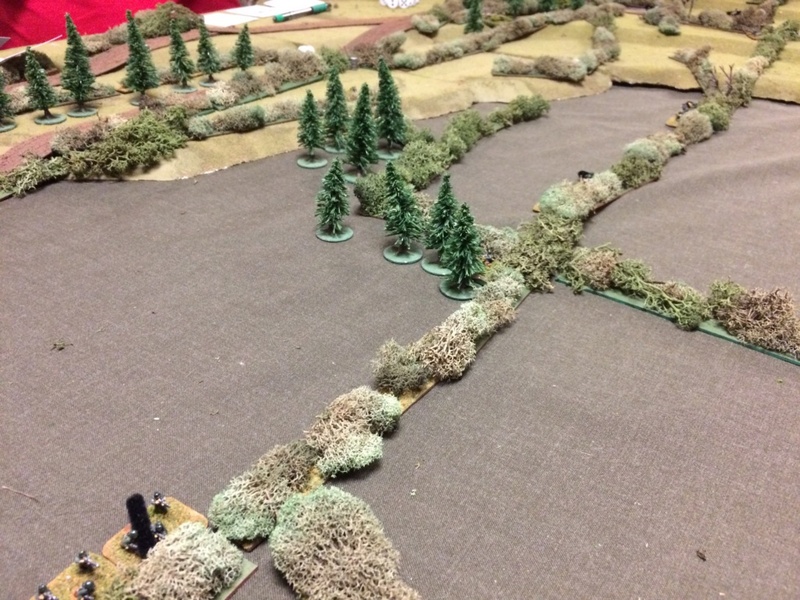 The 1st photo shows the table looking down the valley from behind the German left flank. The German forces all deployed on their half, while the US started with just the M8s on the board and rolling for reinforcements each turn. 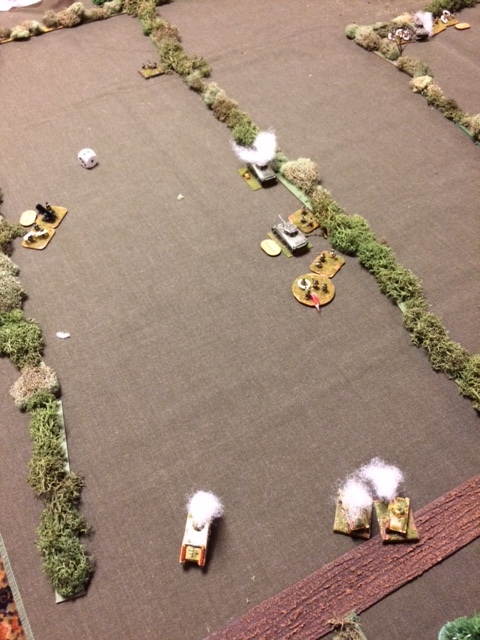 Turn 1 set the pattern for the Germans for most of the game: they couldn’t hit the broad side of a barn if they were inside with the doors closed. 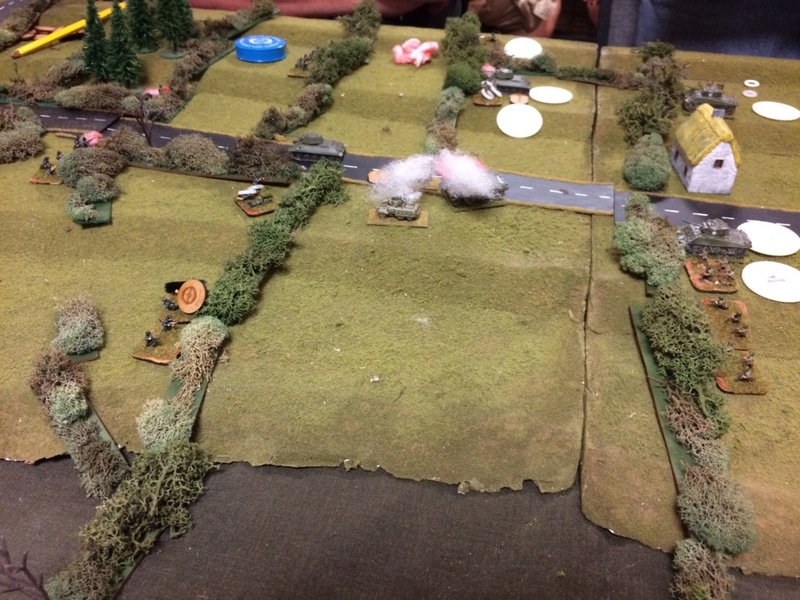 The only time the German Fwd HQ passed the comm check for artillery, the spotting round was lost. 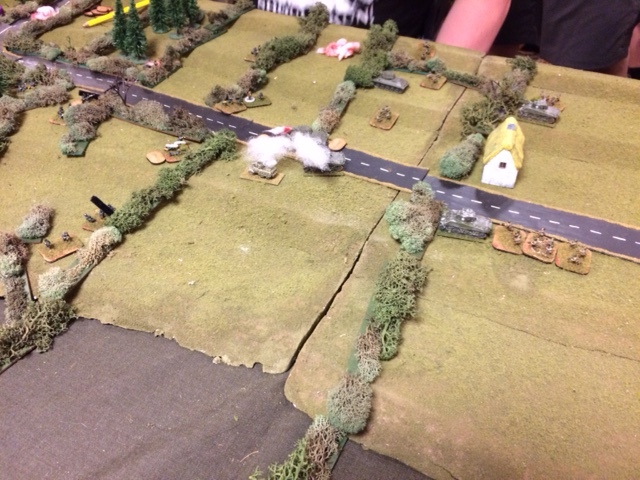 The PaK 43 didn’t kill anything before its demise from a passing P47 in turn 5. 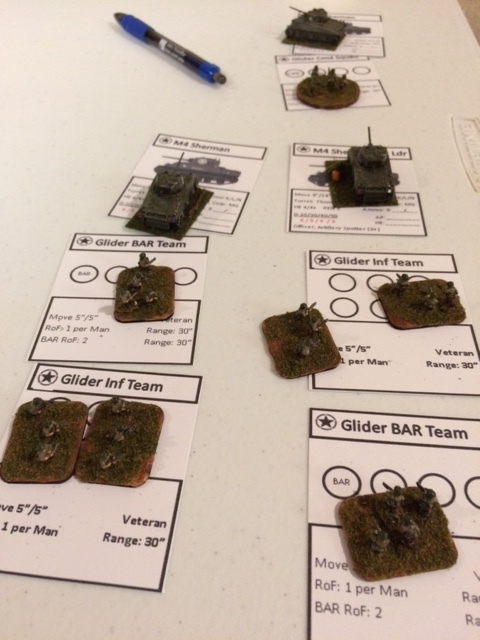 The panzer attack played out just like every other time I’ve run the scenario: the Americans were amused right up until the Char 1 took out a Sherman, then they turned on the panzers with a vengeance. Most of the US forces moved up the paved road, methodically killing Germans with massed firepower. 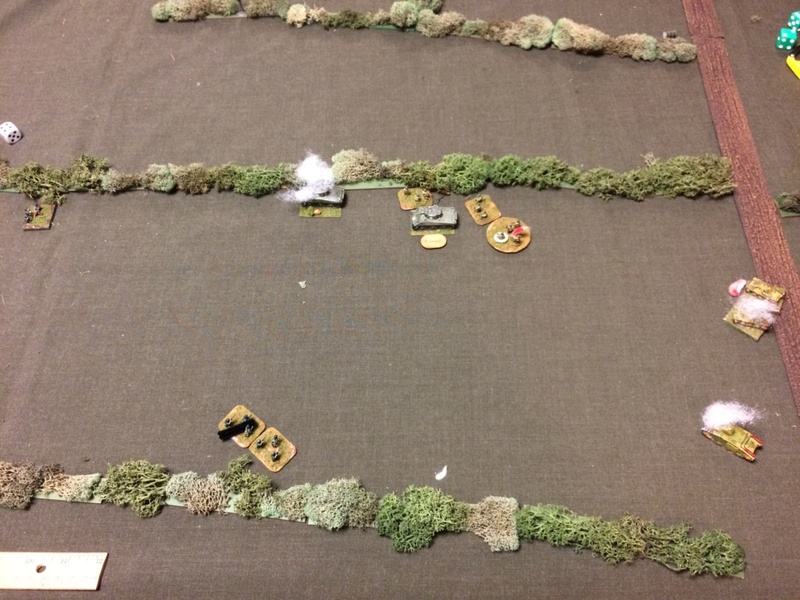 They lost a few Shermans and both M8s when the Germans learned to shoot straight by turn 6, but by then they had lost almost all their anti-tank capability and hit their break point. Nice, All my stuff is 10/12mm so good to know I'm not the only one! Are the black pipe cleaners for firing a Panzerfaust? BG looks good in 10mm. Thanks for sharing.